As we look back on Michael Jackson's career and remember the artist, one year after his untimely death, we can see traces of Jackson's enormous influence just about everywhere. In addition to his music itself -- which was ahead of its time and yet, also, timeless -- Jackson influenced everything from choreography to fashion, even politics. One performer that has a similarly multifaceted approach to his own career, albeit in different ways, is Michael Franti. Reflecting on Jackson's legacy, Franti holds the popular belief that, like the Beatles and Elvis Presley before him, nobody will ever be able to fill Jackson's shoes. 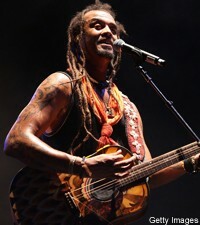 "I don't know if there will ever be anybody that has the unique talent that he had as a singer, songwriter, dancer and with the humanitarian vision as he did," Franti tells Spinner. "But I think there's a new type of worldwide kind of superstar that will emerge. One that incorporates Internet, music technology and social networking into one thing." Franti points to the Black Eyed Peas as an example. And while his music doesn't sound like anything from 'Thriller,' per-se, Jackson's influence certainly surfaces in Franti's role as a performer and public figure. "When I was a kid, I use to tape things off the radio and there was this Michael Jackson interview that came on Casey Kasem's radio show for about an hour and forty five minutes of MJ talking about his life and history," says Franti. "He talked about everything leading up to 'Off the Wall.' I remember I taped the whole thing on cassette and listened to it so many times, I not only had all the songs memorized, but word for word everything he said in between during the interviews." Many if not most of today's performing artists have some kind of similar story of early infatuation with the King of Pop. But Franti actually has a tale involving a brush with him. Kinda. "I was working as an extra on a George Lucas film and we were told MJ was going to stop by the barbeque George was having after the shoot," he recalls. "He flew in by helicopter. When he got off the helicopter he had a mask on. I think it was 1985 or something. He waved to us from about 25 yards away and then sort of skipped into the house -- and we never saw him again!" Sounds about right. It's been a year already and the hole left by Michael Jackson's death has not gotten any smaller.